Home / UncategorizedFoyer design ideas!! The striped wallpaper gives the space a modern, retro feel, while zebra blinds dress up a double height window above. 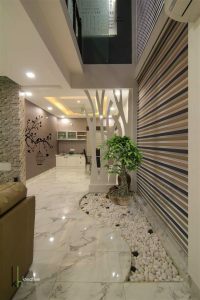 A cut out slab in the flooring creates a niche space for dry landscaping, making for a perfectly neat indoor garden. ← Small Space Decor Tips! !